Croan Cottages are four star self catering cottages, located in Ireland's sunny southeast. The cottages are an excellent base for the golfer who wants to enjoy the outstanding courses, this part of Ireland offers. Ireland was voted the World's best golf destination in 2004 and was also host to the 2006 Ryder Cup at The K Club in Kildare. 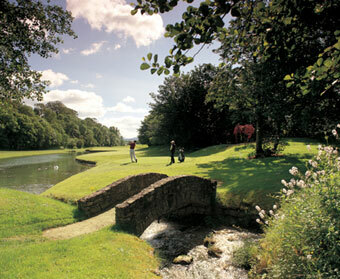 The South East region boasts thirty beautiful 18 hole golf courses and the finest weather conditions in Ireland, by far. This makes the Southeast the most visited area for golfers in the country. Here are details of some of the courses we recommend and their distance from Croan. This 18 hole, par 72, 7,100 yards – 6,500 Metres was designed by Jack Nicklaus and opened in July 1991. The course has already been voted the best inland course in Ireland. Set close to the River Nore, water comes into play on six holes; the beauty of woodland and trees is ever present, while some 80 ever-vigilant bunkers, strategically placed throughout the course, place a premium on accuracy from tee to green. In September 2002 and September 2004 Mount Juliet played host to the World Golf Championships - American Express Championship, which featured the top 50 golfers in the world. Many of the caddies working with these golfers came to stay with us at Croan. Opening Times 8 am to sunset. Facilities All day. Full clubhouse facilities available. One mile outside Ballyhale, off main Waterford/Kilkenny Road. Mountainview is a picturesque 18 hole course situated in South Kilkenny (12 miles from Kilkenny and 14 miles from Waterford). The course offers a wide panoramic view of the surrounding areas from various parts of the course. There are two large sized lakes constructed which come into play on six of the holes. This beautiful all-year-round course provides an exciting challenge for the avid golfer. The club was founded in 1997 and already is a most vibrant one. Green Fees Available on request. Please enquire for up to date group rates. Also open for membership and no entrance fee is required if coming from another club. Facilities Restaurant. Snacks are also available at all times. Meals arranged as required for Societies and Groups. Bar, etc. A wonderful Jeff Howes designed golf course set amidst the old Annaly Estate in the heart of Co. Kilkenny. Incorporating a mixture of old established woodland and lakes, this Par 71, 18 hole golf course provides an excellent test for the low handicap golfer whilst also being very enjoyable for the middle to high handicappers. The newly developed club house and corporate entertainment facilities are especially suited to large corporate groups and societies. Casual green fees welcome - Green fee vouchers available for purchase. Golf Shop, full restaurant and bar facilities. This is a great course and the back nine are spectacular holes. Set in a 200 year old forest, Castlecomer's course provides a great test of golf combined with breath taking views of the local terrain. With the development of this course completed in 2003, it is clear to everyone at Castlecomer Golf Club that Pat Ruddy has designed a unique Golf Course. In total thirteen new holes were incorporated into the eighteen hole layout with tees and greens built to USGA standards. The new holes have sand based fairways with irrigation built in. 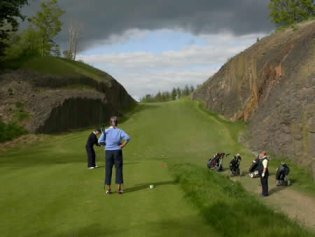 The construction of the latter from the outset is rare for parkland layouts in Ireland, but certainly ensures top class, year round playing conditions, no matter what the prevailing climatic conditions. Callan Golf Club was founded in 1929. In 1994, a new clubhouse was built and the club extended their golf course from 12 holes to 18 holes in 1999. Societies and groups can be accommodated throughout the year including Saturdays and there are very few prohibited days for bookings. For groups of more than 20, special discount rates are available. Please enquire. Facilities Club hire - Trolley Hire - Caddy Hire - Buggy Hire. Green Fees Monday to Friday €25. Saturday, Sunday & Bank Holidays €30. Another beautiful and challenging parkland course. It is permanently maintained in excellent tournament condition as it has hosted the Irish Dunlop tournament, Irish Professional Match-play Championship, the Kilkenny Scratch Cup and is a regular course used by the Golfing Union of Ireland for Competitions. Opening Hours Daylight hours - open to Non-Members - Visitors welcome weekdays. Limited availability on Saturdays. Green Fees Monday to Friday €35. Saturdays only €40. Groups welcome. Facilities Full clubhouse facilities available. We'd be happy to help you plan a trip to some or all of these golf courses during your stay.